Here is an interesting Cover 2 zone pressure concept from Green Bay Packers Defensive Coordinator Dom Capers. The pressure is from a 3-2-6 personnel package. 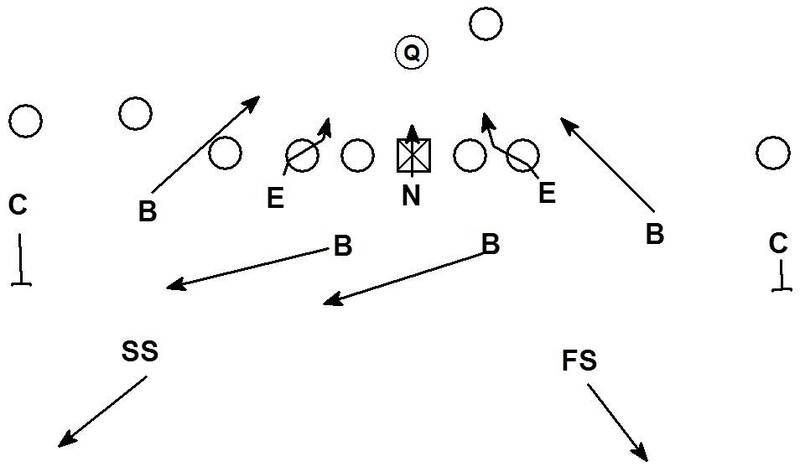 In old playbook material Coach Capers called this personnel Dollar Personnel which is a variation of a dime personnel grouping. 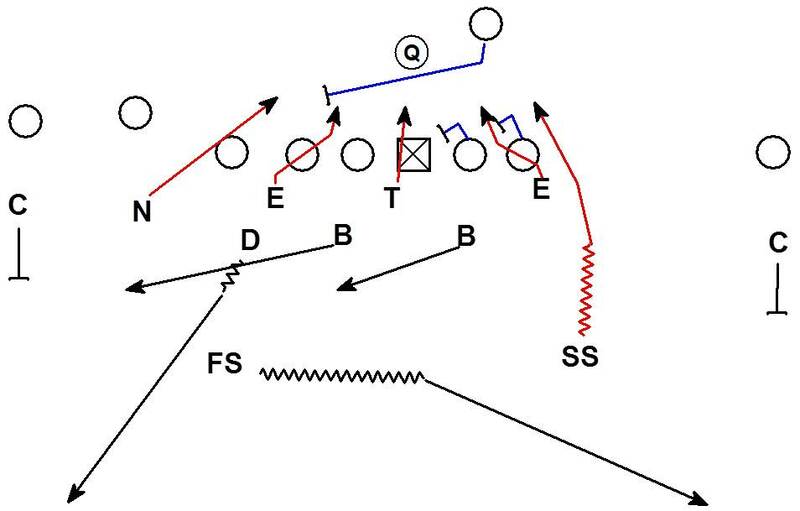 Initially the Packers represent 2 walked up rushing LB's and a possible rush from the Dime. The coverage is showing a 2 high safety shell. The expected blitz pick up for the offense is for the OL to block the immediate gap threats and the RB to scan across the formation to pick up the possible Dime rush threat. 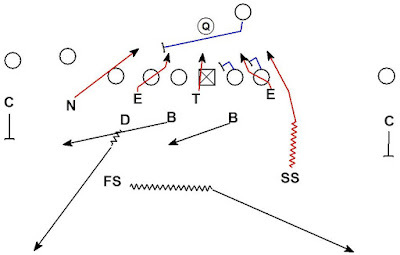 With the defense presenting no 4th rush threat from the weak side the RB is free to scan to the strong side. During the cadence the defense shifts. The pressure the Packers actually brought defies the initial expectations of the offense. The shift by the defense created confusion for the protection. The RG's eyes shift inside as the LB shifts from walked up outside to being aligned in the core. The Guard set inside because he is looking inside. Once the RG set inside the protection had serious problems. 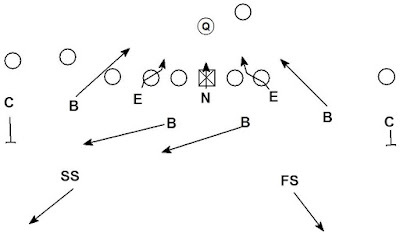 The RT is forced to stay locked on the DE which allows the SS to come free off the edge. The RB thought he was scanning initially so he continues to scan. The timing of the pressure prevents the RB from seeing, processing, and adjusting to the threat of the SS. The coverage also defies expectation. If the QB tires to attack a perceived weak side 1 on 1 match up in coverage there is actually a 2 on 1 concept. Traditional thinking is that if a defense is in a 2 high safety shell and rotates a safety down the coverage MUST be a 1 high coverage. The Packers break that rule. The FS rotating also indicates a 1 high safety but the FS isn't rotating to the deep middle and is instead rotating to a deep 1/2. The flat defending corner to the strong side is also a surprise and forces the QB to double clutch the throw to the strong side flat buying time for the the pressure. This pressure could be easily run from a traditional 3-4 personnel set. What the pressure loses is the manipulation of the protection and the disguise of the coverage. Many OL's & RB's can process and pick up this basic pressure. Many QB's can understand this coverage concept. Creative ways to make basic pressure concepts very difficult to pick up is what makes the NFL pressure schemes so effective.